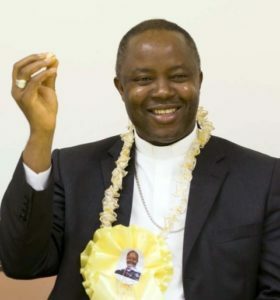 Enugu Catholic Bishop, Reverend Callistus Onaga has rejected Father Ejike Mbaka’s recent apology tendered to the former governor of Anambra state and vice presidential aspirant of the Peoples Democratic Party (PDP), Peter Obi. Bishop Onaga made known his rejection of the apology over the weekend during a diaconate ordination mass offered at the Holy Ghost Cathedral in Enugu state. The apology issued by the catholic priest to the ex-governor was as a result of the embarrassment the priest created during a church bazaar sale. Onaga who supervises Reverend Mbaka’s Adoration Ministry, explained his reason for the rejection of the tendered apology stating that there was no apology as it did not comply with what he (the Bishop) directed him to do. He added, “Before we met Mbaka, he had already apologised to Obi but when we listened to the apology, we realized it was no apology but apologetics, so we mandated him to do a written apology to Obi which he agreed to do and actually did it in our presence. Onaga also spoke against Catholic clerics’ involvement in biased politics and mandated that in accordance to the directives from the Catholic Bishops Conference of Nigeria, priests are not to make political prophecies or endorse politicians or parties. He said, “I urge you all to pray for Fr. Ejike Mbaka. This man has added value to the church through his work. I have on several occasions told him that he is gifted but we must not allow anybody rail-road us into disobeying the directives of the church. “I have heard such cases in some community where the contention was that the priest said that a certain person or the other should be the traditional ruler of a community and the community was in crisis. This is beyond your mandate as priest. Priests are not king makers, just preach and pray for them and let the counties run their affairs. “In the same way, we should also allow politicians to play their politics and steer clear from the endorsements of candidates. Nigeria operates a democracy and not theocracy. We must therefore be mindful to preserve the integrity of the Catholic church,” the bishop said.